The last last update took us off our chronological storyline of the build up to launching Apollo 18 by giving us text about alien life and how it should impact space travel. Now we look to be a little more on course, as we yet another “sensitive” document. 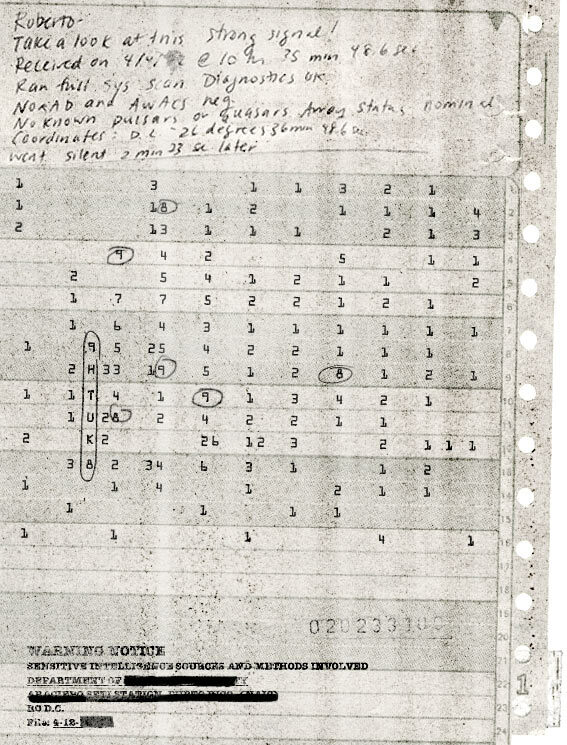 In it, a note is written to “Roberto” on some kind of data sheet with a series of numbers spaced out in a grid. It comes from SETI (Search for Extra-Terrestrial Intelligence), which at the time was at least partially funded by the US Government. The unknown person who wrote the note and pulled the data sheets is saying that they’ve found a radio signal that does not correlate with regular space anomalies. The signal looks to have been received on April 4th, 1972 and lasted for 2 minutes and 23 seconds before going silent. The data seems to support that this is an intelligent extraterrestrial radio signal, though those numbers don’t mean much to me at all, including the circled ones. Could those be part of some code? The image’s name, the number “020233100”, is on the document itself, which leads me to believe that is important as well, though again, I am not sure how. Take a look for yourself and let us know if you can figure out any hidden clues or meanings. Apollo 18 opens in theaters on April 22, 2011. For more information on the film and its viral campaign, check out our Apollo 18 Viral Page. Unfiction forum member Minz has been able to decipher a bit more from the document, including where the signal may be coming from. As someone already posted somewhere on the net*, the image is a SETI signal sheet showing a signal spike similar to the wow signal. the numbers and letters are the signal intensity. Looking at these coordinates on the day specified you can find that the moon had these celestial coordinates during the time of mesurement.